The Tsue Chong Company, in Seattle’s International District, has been run by four generations since 1917. Tim’s great-grandfather, Gar Hip Louie, came to Seattle from a village near Toishan, in the Guangdong province of South China. He saw an opportunity — there were plenty of Chinese restaurants, but no noodle factories. 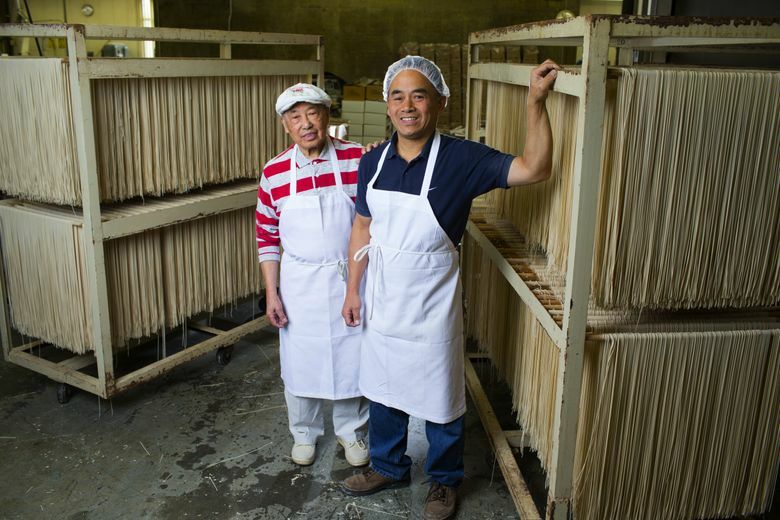 He used a hand-cranked machine to make noodles, then wrap them in newspaper and deliver them fresh. Tim’s grandfather, Fat Yuen Louie, took over when his father retired. He ran the business with his wife, Eng Shee, who added fortune cookies, and the company grew rapidly. About the time Tim started elementary school, Fat Yuen and Eng Shee Louie retired, and their sons, Tim’s father, Henry, and his uncle Kenneth, took control. Tim spent teenage summers working at Tsue Chong, but says he never felt pressure to join the company. In fact, he left Seattle to study science at Whitworth University in Spokane. Two years later, he transferred to the University of Washington and changed his major to business, and only then did he consider a career at Tsue Chong. His father made him learn the business from the ground up. All his employees are Chinese; they speak Toishan or Cantonese, and live on Beacon Hill or in the International District. Most came from China at middle age to give their families better opportunities, and most spend their entire careers at Tsue Chong. Tim says they’re very dedicated and loyal, one of the main reasons Tsue Chong’s production has remained in Chinatown since 1917. They produce about 80,000 fortune cookies and 10,000 pounds of noodle products a day, including fresh, dried, steamed and fried varieties, and dumpling wrappers for wonton, gyoza and egg roll. Just as Tim’s father didn’t pressure him to join the business, he and his wife, Linda, encourage their two children to do what they want. It seems unlikely the company will stay in the family. Tim doesn’t seem concerned, as long as Tsue Chong continues as an integral part of the community, one he feels loyal to and serves in another very different way. For 35 years, Tim has been Scoutmaster for the Boy Scout troop he belonged to as a boy. When Tim transferred to the UW, a friend told him the Scoutmaster was retiring and asked him to help him lead the troop. Tim agreed, arranging his studies around Scouts on Tuesdays. Over the years, Tim has served as Scoutmaster to countless boys, including his son, Gregory, and he’s proud of the men they’ve become. Tim says he feels fortunate and blessed to have a close-knit family, run a thriving business he cares about and be part of a supportive community. But it’s clear his success is due to much more than luck. Leora Y. Bloom is the author of “Washington Food Artisans: Farm Stories and Chef Recipes.” John Lok is a Seattle Times staff photographer.